It's all done! A new oh-so-soft pink knit comfy outfit. Would you like to see? Oh, please, let me show you. 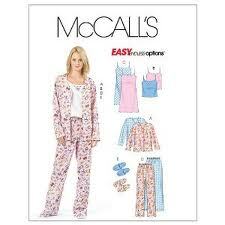 McCall's M4979 pattern really is Easy. Once I got over my late-night serger issues (you can read that post here) everything moved along quick and easy. Pattern instructions are written for a 5/8" seam allowance, so I took that into consideration and cut out a smaller size knowing I would be serging a seam of 1/4". The fit is slouchy and comfy so it worked well. Instead of interfacing the lapel and adding buttons, my serged edges were turned under and finished with a straight stitch close to the edge. I like the finished edge on this knit. Not very attractive hanging around on the hangers, but you get an idea of the finished outfit. I wore it last evening. It was everything I wanted.... soft, comfortable, relaxed, yet coordinated. What a lovely, comfy, lounging outfit! The only thing better would have been a picture of YOU modeling it! I can see why you chose this pattern . . . the model on the pattern looks like you! I wish!!! It's a nice feeling wearing something you made yourself. Now I'm trying to decide what's next on the list to make. Thank you for your sweet comment and support. PS Still wanting to step my toes in quilting this year. Yours are always so inspiring.